One of my creative struggles is with overworking the art. 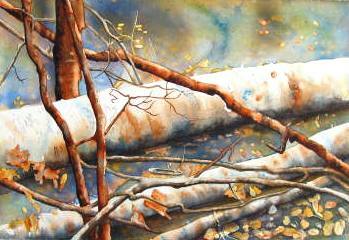 Just one more tweak to a branch, one more glaze to the dark, one more lifting of the colour to get the light back. I try to restrain myself and leave things be. Less is more. Thanks goodness deadlines press on, my attention span is short and there is always the anticipation of the next painting. I went to Art College. I paint and like to make things. This is what I have in common with most artists, not art college, but that we are makers of things.